What or where is home for you? Is it a structural object, house, apartment? Is it a sharing of energy, being with the people or things you love? Or is it a sense of self, satisfaction, happiness, love? Are you aware of the light in your heart? What does this mean to you, for you? Your understanding of shining your heart light may be different to someone else’s, but essentially, it is about honesty, self acceptance, owning your truth, walking your talk, and sharing your gifts with others. “What gift” you may ask yourself. We all are gifted in some way. Yours may be the gift of kindness, of being a good listener or mentor. It may be the gift of hospitality, of making others feel welcome, or it may be that your gift is expressed through your work. Regardless of its genre, know and remember, there is only one you. 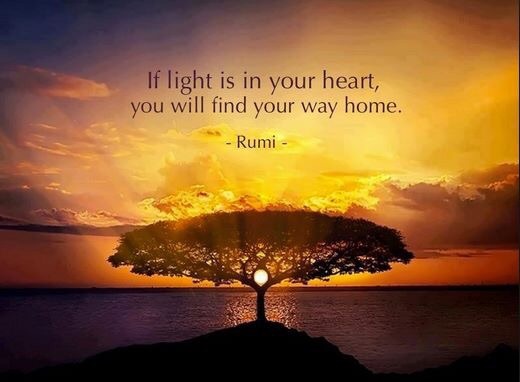 And when there is light in your heart you will find your way home.